Welcome to Back To School Shopping Giveaway! With Summer nearly over and school registration coming up fast, it is time to consider what we need to get our families ready for that dreaded “Back to School” frenzy. 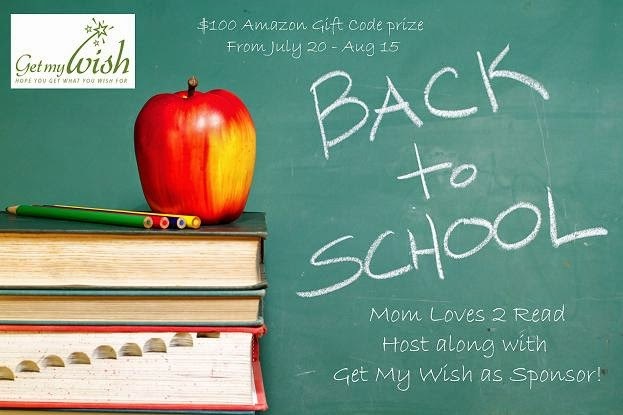 To make it easier, or at least a little less expensive, Get My Wish has partnered with Mom Loves 2 Read and some amazing bloggers to bring you a fun and fantastic Back to School Shopping Giveaway Bash! Now for the Giveaway Fun. Enter below using the Giveaway Tools form for a chance to win $100 Amazon eGift Code to help with your Back to School shopping. Mandatory to create or have a Get My Wish registry. Open World Wide, must be 18+ to enter/win. Giveaway ends 11:59pm CST on August 15th. Entries will be validated. Winner will have only 48 hours to claim prize – no reply after 48 hours will result in another winner being chosen. So what are you waiting for? Get ready for your wishlist and shop free if you win the Back to School Shopping Giveaway! Disclaimer: Neither Mom Loves 2 Read nor Work Money Fun is responsible for prize distribution. Sponsor: Get My Wish is responsible for sending prize to winner after validation. This giveaway is in no way associated with any social media.